January 19, 2018, 10:04 AM · Dutch theme park Efteling (winner of last year's Theme Park Insider Award as the world's best theme park) is seeking approval for a 20-acre expansion in order to build a new attraction for 2020. The park has proposed rezoning 20 acres on the eastern edge of the park, south of the Efteling Hotel, to allow the park to expand. That plan will be considered by the local council this summer. However, Efteling is asking for earlier approval for a part of that plan — to allow the rezoning of about seven acres in order to start site prep for construction of an as-yet-unannounced new attraction for 2020. 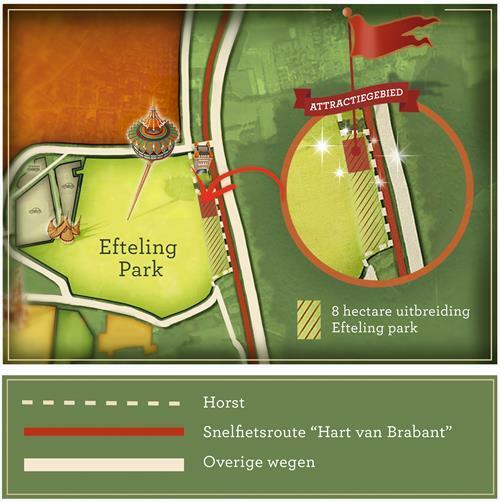 The plan would expand the Travel Kingdom land of the park and will require the relocation of the Efteling Hotel's entrance to the park, which will become a direct entry under the expansion plans. Efteling and the local government currently are diverting an access road that runs through the proposed expansion area. That work is expected to be complete by the end of this year. Consider this a green light for fans to start speculating about what new attraction they would like to see the park add for 2020, as well as what else they would like to see Efteling do with this expansion area in the years beyond that. Ideas? January 19, 2018 at 4:24 PM · I hope they'll built their version of a mountain-like logflume. Partly indoor, part outdoor. January 20, 2018 at 7:56 AM · 84.27.199.232 ... :-) ... In this part of the park, will not be an outdoor thrill ride of whatever kind. To start with: thrill rides belong to the "Ruigrijk" theme section of the park. Second, there is this historical aggreement with the local community never to build open air thrill rides (daylong screaming noise) at this side of the park. January 20, 2018 at 8:11 AM · Interesting to know that Efteling first informed through the 'WONDER***' pass-holder-members magazine (2 full pages) and only thereafter on line in (much shorter) press announcements. Very nice, as this is the symbolic gesture, that the pass-holders are respected as prime customers. January 21, 2018 at 4:36 AM · Some time ago there was a rumour going around that Efteling had plans for a big coaster, probably another B&M. But now the Efteling director said the new attraction "won't be a small one, but nothing screamy." I got no idea what they have planned. I'm pretty curious if Efteling could pull off something like a super immersive flat ride. January 21, 2018 at 4:40 AM · @Herwig Delvaux. Do you know if they put all the rollercoasters in one place because they are only allowed to put rollercoaster in that area? I don't really like that all the rollercoasters are packed in one place, Bob and vogelrok being an exception. January 21, 2018 at 8:56 AM · I still think it's not a done deal for them to expand in that forest area. Efteling started small, very small. There was no plan and there is not a lot of place to expand. I hope Efteling can make it work for all because it's truly a special park. January 22, 2018 at 3:17 AM · @OT. The park didn't actually start very small. The area visitors could visit at the start of the park is about the same size as it is now, I believe. But back then it was only a big (sports)park. Efteling also still owns a lot of extra land, but I don't know if they are able to build on that land. But I wonder if Efteling can pull off a super immersive ride that is not a roller-coaster or dark-ride. January 24, 2018 at 1:10 AM · @Sven: yes, that has to do with sound levels and where that part of the park is, compared to the nearest residents.